What is the advantage of micro-fat injection to cheek? - There is scarce of swelling, bruise, and scar. How many times of fat injected is needed? harvested frozen fat and additional micro-fat injection is easily performed..
- When eyelids are depressed and seem to have protruded eye appearance. What is the advantage of micro-fat injection to eyelids? 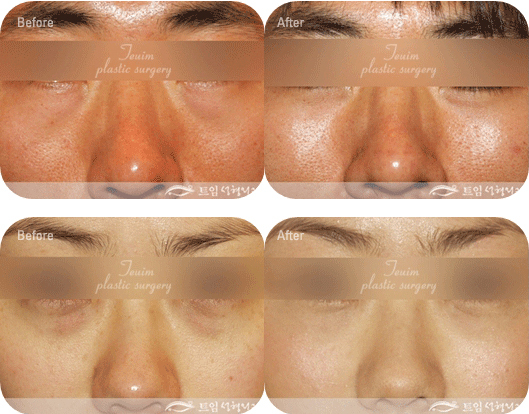 - If upper eyelid is depressed, micro-fat injection make more natural contour of your eye shape. 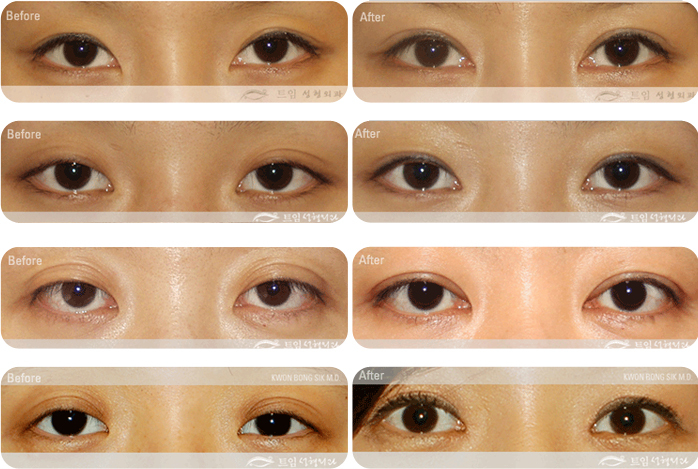 reduced the thickness of double fold, then you will get more natural, attractive eyes. injection is often needed, you’d better more satisfied if you consider two times injection of micro-fat. When does micro-fat inject to lips? - If there are many fine wrinkles around your lips. - If there is asymmetry or there is much difference of thickness between upper and lower lip. What is the advantage of micro-fat injection to lips? -Micro-fat injection improves both of lips shape and find wrinkles. -You can return to ordinary daily lift immediate after the surgery. -There is scanty of swelling and bruise. - Lips are area having most low rate of fat survival. We use specialized techniques to improve fat survival for micro-fat injection in lips. For most satisfactory result, it needs usually 2-3 times injection of micro-fat at the interval of 3 months. We can use your harvested frozen fat and additional micro-fat injection can be easily and safely performed. 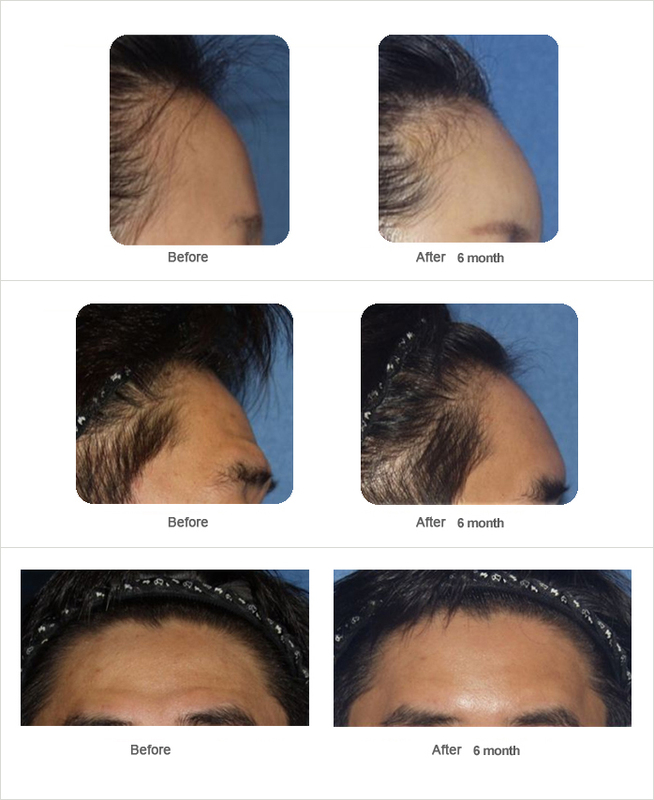 However, as nose wing or nasal ala has thick skin, there is some limitation in effective and satisfactory augmentation by micro-fat injection. 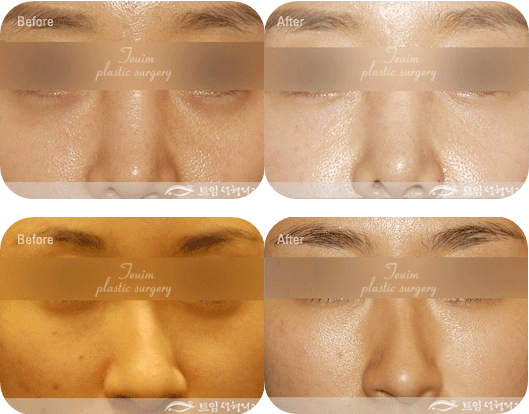 What is the advantage of micro-fat injection to nose? - As it is harvested from own human tissue, there is scarce complication or adverse effect that is often seen in silicone implant augmentation of nose. - You can return to ordinary daily lift immediate after the surgery. - There is no scar. When does micro-fat inject to chin? - As it is harvested from own human tissue, there is scarce complication or adverse effect such as foreign body senasation or contracture that is often seen in artificial implant augmentation of chin. When does micro-fat inject to forehead? - If you want more protruding, voluminous forehead. - If you have deep forehead wrinkle, which cannot be spread out when you pull out your forehead skin. 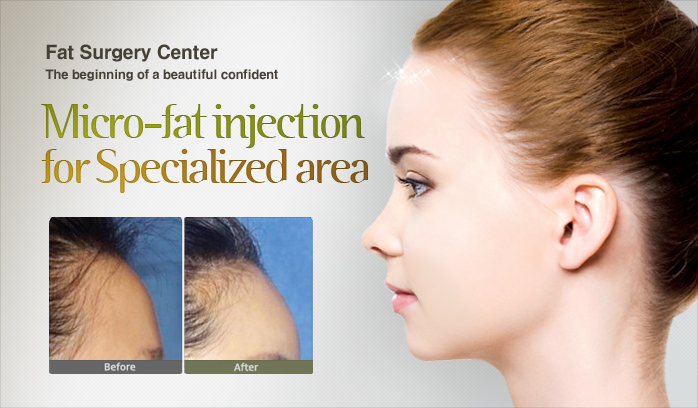 What is the advantage of micro-fat injection to forehead? -As fat is harvested from own human tissue, there is scarce complication or adverse effect such as foreign body sensation or contracture that is often seen in artificial implant augmentation of forehead (for example, silicone or GoreTex). - There is no scar and the final contour of forehead is natural. - As injected fat is well taken and survived in peoples’ own tissue, the effect is relatively long-lasting. - Cheek, temporal area, and forehead are areas having relatively high rate of fat survival. For most satisfactory result, it needs usually 2 times injection of micro-fat at the interval of 2-3 months. If there are depression and deep wrinkles on your forehead, micro-fat injection produces very satisfactory and aesthetically pleasing result because wrinkles and soft tissue depression are corrected simultaneously. - Although fine wrinkles can be corrected by injection of Hyaluronic Acid Extract and Botulism toxin, deep wrinkle cannot be corrected by above materials. Accordingly, micro-fat injection is most suitable and effective procedure for deep wrinkles. Sometimes, we can inject fillers, Botulism toxin, and micro-fat simultaneously. When does micro-fat inject to temple area? - It is different from patients to patients because temple area has many variation of fat absorption rate. For most satisfactory result, it needs usually 1-2 times injection of micro-fat at the interval of 2-3 months. If there are depression and deep wrinkles on your forehead, micro-fat injection produces very satisfactory and aesthetically pleasing result because wrinkles and soft tissue depression are corrected simultaneously. - When your lower eyelid skin has relatively dark color However, micro-fat injection is rarely effective when there is sagging of fat in your lower eyelid, dark cirlcle with protruding eyes, having too many fine wrinkles, severe drooping of lower eyelid skin. 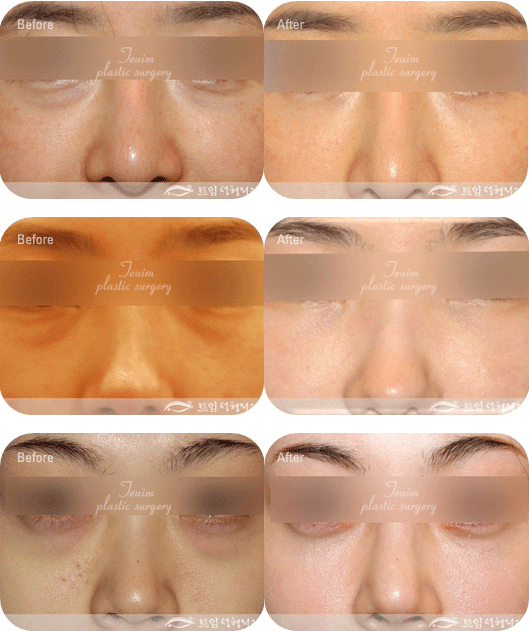 What is the advantage of micro-fat injection for dark circle? - Micro-fat injection correct depressed area in lower eyelid and there is skin color change from gloomy dark color into more bright color. 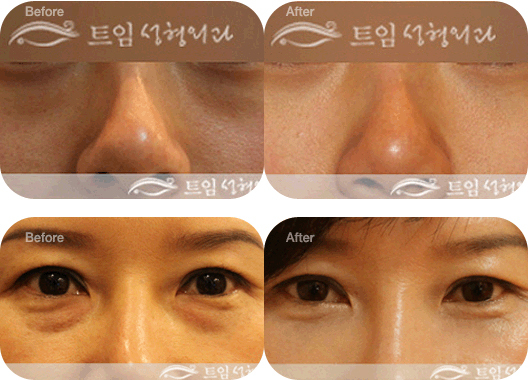 - It expand lower eyelid skin and there is improvement of fine wrinkles and bleaching effect of lower eyelid pigment. - There is no skin incision. Therefore, there is no scar. - If there are good blood circulation, injected micro-fat is better taken. The area having most abundant blood circulation is around eyes and fat is survived most effectively around eyes. Accordingly, the highest rate of fat survival is occurred around eyes. Therefore, only 1 time injection of micro-fat may usually acquire permanent and effective aesthetically pleasing result. However, as secondary micro-fat injection is often needed, you’d better more satisfied if you consider two times injection of micro-fat. However, you can use your harvested frozen fat and additional micro-fat injection can be easily and safely performed if there is some need of re-injection of fat. - Deep naso-jugal fold, which means wrinkles between eye and nose such as tear trough. - As fat is harvested from own human tissue, there is scarce complication or adverse effect. - There is scanty of swelling or bruise. - As injected fat is well taken and survived in peoples’ own tissue, the effect is relatively long-lasting. - Usually 2 time injection of micro-fat with interval of 2-3 months may usually acquire permanent and effective aesthetically pleasing result. However, as additional micro-fat injection is often needed, you’d better more satisfied if you consider two times injection of micro-fat. However, you can use your harvested frozen fat and additional micro-fat injection can be easily and safely performed if there is some need of re-injection of fat.